An over-the-top swing goes across the ball at impact, creating a bad outside-to-in swing path. One of the most common swing faults in golf is the over-the-top downswing--it plagues most recreational players and even a few avid ones. A golfer who swings over the top, swings across the ball at impact, creating an outside-to-in swing path. There are a number of different ways you can fix an over-the-top downswing. 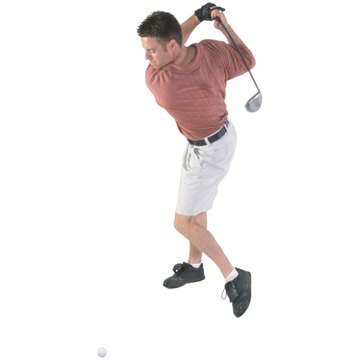 Set up to the ball with your feet aimed right of the target line and the club face square to the target. Make your normal backswing and try to make your downswing along the line of your feet. This will help produce an inside-to-out swing path rather than outside-to-in. Most players who swing over the top on the downswing do not get enough shoulder turn on the backswing. By getting a bigger shoulder turn, you allow the club to swing inside-out coming into impact. Check your shoulder turn by making sure your left shoulder rotates under your chin on the backswing. An improper setup also can cause a golfer to swing over the top. If your shoulders are aimed left of the target line and your head is in front of the ball, it promotes an over-the-top downswing. By squaring your shoulders to the target line and shifting your head behind the ball at address, you can make the proper backswing and downswing.